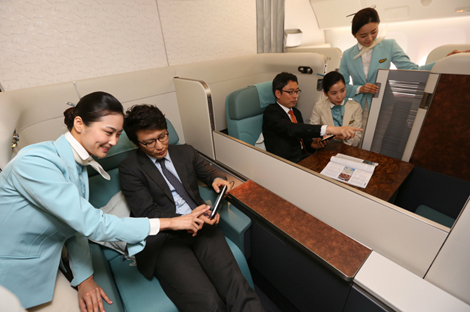 Privacy enhancements and upgrades to the inflight entertainment system are part of the additions to Korean Air’s new first class Kosmo Suites. 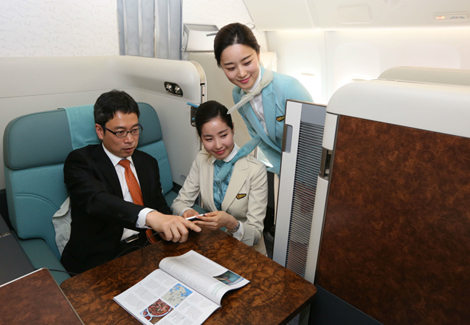 The airline said the upgrade will be introduced on B777-300ER aircraft, followed by the B747-8i, B787-9 and A330-300. The B777-300ER will offer eight seats in first class, 42 in business (Prestige), and 227 in economy. One of the features of the new suite is a sliding door that the airline said will provide complete privacy to passengers. The 24-inch inflight entertainment screen is now fully touch-enabled, while a new handheld touchpad controller has also been installed. Users can browse through entertainment content via the controller’s mini-screen – useful for when reclined passengers do not wish to reach for the main monitor.